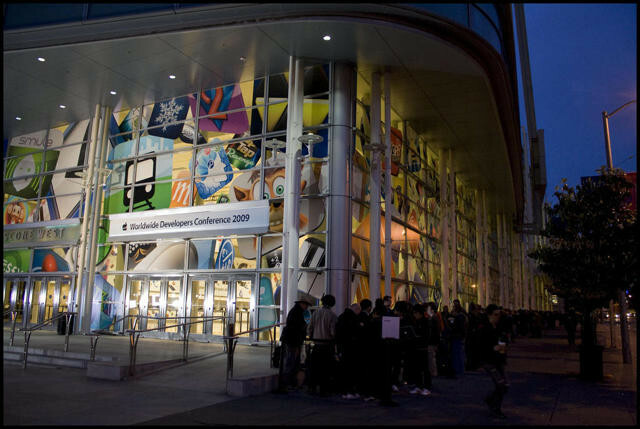 The line for this morning’s Schillernote at WWDC was already several blocks long before the first light of dawn. See the pictures on Flickr and reports on Twitter. Compare to this unintentionally hilarious collection of pre-dawn Palm Pre lineup photos. Talking of Twitter, there’s been several tweets saying Steve Jobs has been spotted at WWDC. ‘I’m guessing, but MrRooni’s tweet looks like a joke to me. But now the joke is spreading, and others are treating it as real.